The discovery and use of radio waves for communication was nothing short of a major revolution and paradigm shift in the speed of communication. Previous to this the fastest method of communication would have been by telegraph or on the newly invented telephone. All were in line of sight or reliant on fixed lines. Now communication could be carried out literally the speed of light over pretty much any distance. Righi Oscillator or Spark-Gap, 1895. An instrument for generating radio waves invented by Augusto Righi of Bologna, who was influential in directing Marconi’s scientific interests. 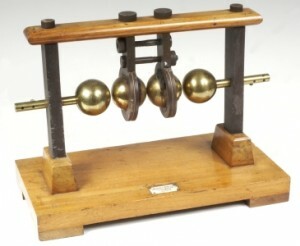 In 1896 Marconi brought this example to England, where he used it in demonstrations for the Post Office. Radio waves occur naturally, so were not ‘invented’ as such, but it was in 1887 that German Heinrich Hertz proved the existence of what Scotsman James Maxwell had theorised earlier – that a remote effect could be caused by electricity. Despite his discovery, Hertz did not see any purpose for this effect. 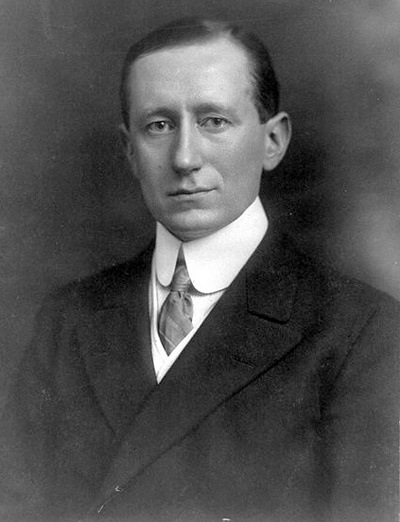 It took the experiments of Italian Guglielmo Marconi to successfully harness electromagnetic propagation’, more commonly known as radio waves, for commercial communication. Working on improving the Branly tube, a device used to detect radio waves, Marconi invented the radio antenna, and experimented further with the assistance of his brother Alfonso. They transmitted Morse code signals to each other across a field – Alfonso would acknowledge receipt of a transmission by waving a flag. When Marconi moved on to check if signals could pass over hills and mountains, Alfonso was out of sight and fired a hunting rifle into the air to let Guglielmo know he’d got the message. Despite the monumental implications of his experiments, the Italian government showed no interest in helping Marconi to develop them, so he decamped to Britain. Unfortunately, British customs officials went through his bags and managed to break his radio equipment, labelling it an ‘infernal machine’! All was not lost, however, and Marconi went on to give the first public demonstration of ‘wireless’ in 1896 in Toynbee Hall, London. The next year he set up the Wireless Telegraph and Signal Company, which manufactured radio equipment and maintained radio stations. In 1909, he received a Nobel Prize for Physics for his efforts in the field of wireless technology. Interestingly though, the ‘father of radio’ turned out not to be the true father, and in 1943 Serbian inventor Nikola Tesla was credited as radio’s true inventor. Marconi’s patent was overturned in favour of Tesla in the US Supreme Court – his Tesla Coil had been patented before Marconi’s experiments, but Marconi’s influential friends had managed to get the US patent for radio taken from Tesla and given to Marconi in 1904. Alas, Tesla died in 1943, just before he would have seen the patent rightfully returned to him. The first radio broadcast took place on Christmas Eve 1906. Canadian Reginald Aubrey Fessenden used a 420ft-high radio mast in Massachusetts to broadcast himself playing Gounod’s ‘O, Holy Night’ on the violin. He also sang some songs and read a few passages from the Bible. His transmission was picked up by ships at sea. A year later, the first British broadcast occurred when Quentin Crauford of the Royal Navy aired a concert from HMS Andromeda for the benefit of other ships. But it was once again Marconi who was responsible for the first broadcasting service in Britain in 1920, producing 30-minute programmes that went on air twice a day. Eventually, along with a couple of other stations Marconi’s 1922 station 2LO was bought up to form the British Broadcasting Corporation (BBC) in the same year, when the first BBC news bulletin went out on 14 November. A further significant development in radio occurred in 1934 when Edwin Armstrong introduced FM radio. ‘Frequency modulation’ uses more complex technology than ‘amplitude modulation’ (AM) – the frequency transmitted adjusts itself to suit the sound wave it is carrying, helping to avoid interference from other electrical equipment.